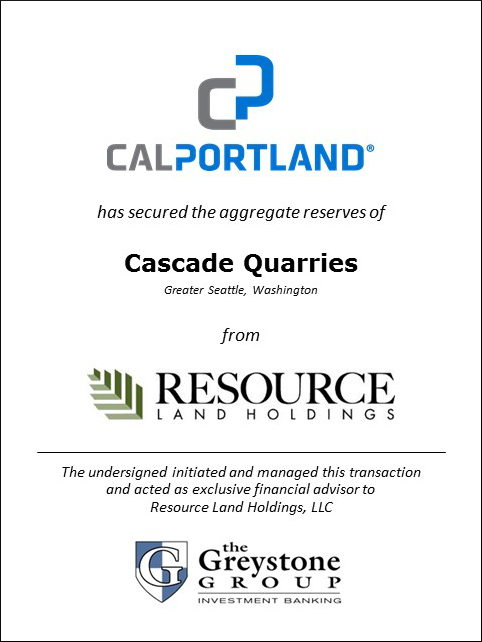 SAN DIEGO (June 1, 2015) – The Greystone Group announced today that it advised Resource Land Holdings on the lease of the Cascade Quarries to CPC Materials, Inc., an affiliate of CalPortland Co. “We have enjoyed our relationship with RLH and are pleased to have been able to assist them in securing a strong operator to mine the Cascade Quarry, located in Snohomish County, Washington” said Tim Oitzman, President of Greystone. Cascade Quarries is a hard rock quarry situated on 128 acres estimated to contain more than 50 million tons of high quality aggregate reserves. The quarry is located near Gold Bar, Washington and is well positioned to supply high quality road base and other aggregate products. RLH was founded in 1998 to invest in agricultural, timber and mining properties in the U.S. Through partnerships with local brokers, operators and entrepreneurs, RLH invests in properties across a broad range of resource-rich asset classes. To date, RLH has organized and managed two separately funded entities as well as four private equity funds. CalPortland Company is a major producer of cement, concrete, concrete products, aggregates and asphalt in the western United States and Canada. Founded in 1891 with the principle of providing unsurpassed quality, CalPortland remains a leader in the industry through its commitment to quality, customer service, technical support and environmental leadership. The company maintains its headquarters in Glendora, California and operates in the Western U.S. and two Canadian Provinces. CalPortland is one of the largest integrated construction materials producers in Washington and Oregon.